Meanwhile, heat oven to 350°F. Spray 2-quart casserole with nonstick cooking spray. Spray medium saucepan with nonstick cooking spray. Heat saucepan over medium-high heat until hot. Add onion and chile; cook and stir 2 to 4 minutes or until crisp-tender. Remove from heat. Add milk and sauce mix; stir until well blended with wire whisk. Bring to a boil, stirring constantly. Reduce heat to low; simmer 1 minute. Stir in both cheeses until melted. Add cooked rotini; mix well. Spoon into sprayed casserole. In small bowl, combine chips and margarine; mix well. Sprinkle over rotini mixture. Bake at 350°F. for 25 to 30 minutes or until bubbly and golden brown. Chile con queso is a melted cheese dip made with mild green chiles. In Mexican restaurants, the dip is served with tortillas and raw vegetables. This hearty macaroni casserole resembles that popular appetizer. For better contrast, use yellow corn chips for this recipe, but any tortilla or corn chip will do. 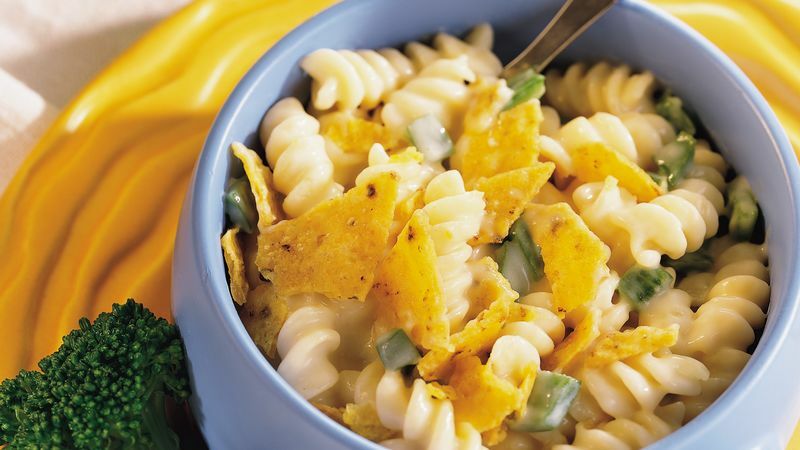 For extra zesty flavor, try nacho chips. An Anaheim chile can be substituted for the poblano - it is slightly milder. Serve this great family casserole with steamed broccoli and a gelatin salad.